Have you ever told someone about a book or a movie you’ve loved, that just hit you in the right place and you went on and on about it and told the person they just had to see it? And then they go out and read it or watch it and come back to you, after all your build-up and say, "eh. it was pretty good." Too much build-up leads to let down sometimes. That’s kind of how I felt after this post. I was so in love with the process that I’m worried maybe I built up the end product a little too much. I’m flattered that some of you thought I had the woodworking skills to create things so difficult or intricate–like a musical instrument. But, alas, I’m quite the beginner. Quite. I made hardwood cutting boards this winter as Christmas presents for my family. And I’ve been itching to make more ever since. These boards are made from one solid, wide plank of wood. They are not edge-glued like most cutting boards today. They have been worked and smoothed both with tools and by hand. They are only treated with a gentle mineral oil that brings out their naturally rich, deep color. 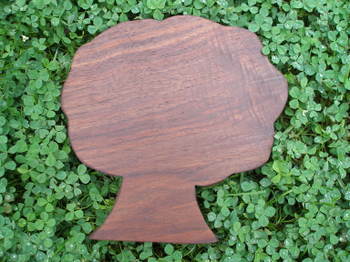 These boards were fashioned after boards that grace the kitchens of my grandparents. And those boards, cut from the same wood, look just as beautiful–if not more–some twenty years later. There are only two boards for now. If there’s a positive response, I think I’ll look into making more–maybe by pre-order only, or maybe I’ll just make another batch. We’ll see. For now, I’m enjoying trying my hand at something new. If you are interested in purchasing one of these, send me an email and I will invoice you through paypal. Lovely, Molly! I bet you’ll sell a bunch for the holidays. My mom would love the bird one. They are beautiful! I don’t think anyone is going to be disappointed at all. they are so stunning! Simple and delicate…i really love them! well done! they are gorgeous molly! absolutely beautiful! Oh Molly, these are beautiful. I need to ask my hubby first, but I want to order 2 of the bird ones… one for myself and one for my Dad. When I was a little girl, my parents called me their “little birdie”, so this would be an all-appropriate Christmas present for my Dad. They are beautiful. So simple in design, which allows the beauty of the wood to really come through. 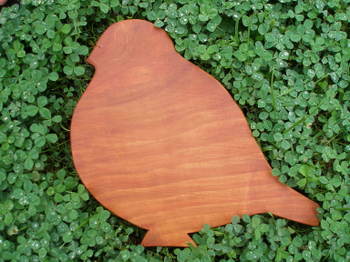 I would love to see a row of birds or trees mounted in a row…stained in the different shades or something. BTW, your typepad looks fabulous! stunning. they are just stunning. and i love your new banner! those are lovely! i really like how fat the sparrow is. i love them. you are so clever.